OXFORD, Miss. 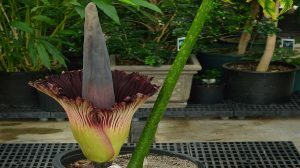 – Just keep watching – that’s the best advice for witnessing the soon-to-blossom, towering titan arum housed in the atrium of the University of Mississippi School of Pharmacy’s Faser Hall. The odd-looking plant, which has the largest unbranched flower cluster in the world, is expected to bloom any hour now. Lal Jayaratna, a research and development botanist with the Maynard W. Quimby Medicinal Plant Garden of the National Center for Natural Products Research, where the plant is usually housed, said he believes the plant will blossom Thursday or Friday. On Thursday morning, a steady stream of onlookers viewed the titan arum in person in the UM School of Pharmacy, some even posing for pictures. A live stream of the titan arum is also available at the Ole Miss Pharmacy YouTube page. The plant, native solely to western Sumatra and western Java in Indonesia, is grown at the garden as a collection and also for research by NCNPR scientists on the chemistry of different parts of the plant. The garden is home to three mature titan arums and a few others. The blooming of the plant is a rare sight, with the titan arum taking about five or more years to start flowering. It then subsequently blooms infrequently, once in three or four years, and even more rarely in cultivation. In 2014, UM housed two plants that bloomed within weeks of each other.